To book the court, please use our online booking system, "Skedda." All members have been given access to create a login. The information below provides instructions. The site appears as a booking sheet with a black header. The court availability is shown - booked time slots are highlighted in blue and available time slots are white - as you hover the pointer over an available slot it will show as green. To create a login, click on the 'Log in' button in the top right corner. Users will not be able to book a time slot without loggin in. A box 'Let's see some ID' will come up. This is where users need to start each time they come in for a booking and to register for the first time. To create a login for the FIRST time, click 'Register' in the bottom right corner of the pop-up box. The bottom selection 'Or your password' is the most straightforward method. Enter the email address and password used during registration. 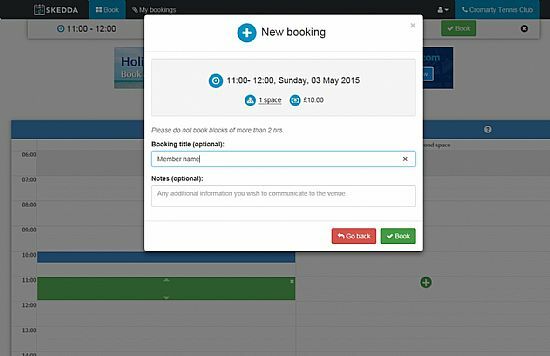 Once logged in a user can make a booking. Scroll down and click on the time slot desired. Use the arrows or the calendar icon on the top left of the blue bar to move to the correct day. After clicking, a green box will appear in the time slot. Drag the white arrows shown in the centre of the box to expand the time slot to an hour. Once the hour slot is selected, click the green 'Book' box that appears in the top right of the screen. Type in the name of the person making the booking in the 'Booking Title' box and click the green 'Book' box in the bottom right. PLEASE NOTE: THE £5 FEE PER TIME SLOT IS NOT APPLICABLE TO CLUB MEMBERS AND IS SHOWN AS THE COST FOR VISITORS. After selecting 'Book', a screen will come up with two choices - the user can either click the box 'Complete the booking' or the box 'Cancel booking'. Once booked, you cannot make any changes. Once a booking is completed, an email confirmation will be sent. The user can then log off in the top right or continue using the site. Please contact Ross Couper with any difficulties.